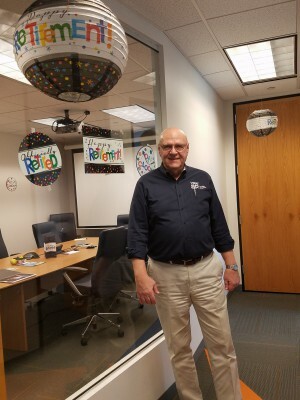 AUSTELL, Ga. (April 3, 2018) – YKK AP America Inc. today announced the retirement of Mark Richards, General Manager of the Northeast Region. Richards’ commitment, leadership and strategic business approach strengthened his team members in Baltimore and Boston, and grew YKK AP’s footprint in the region. Baltimore Branch Manager, Derick Clutchey, will assume leadership of the Northeast region. Richards joined YKK AP America in 2006 as Branch Manager for the Boston branch, and in a short time frame he acquired the responsibility of managing the Baltimore branch as well. Over the years, Richards has continually strived for excellence in every endeavor and empowered those around him to seek the same. Since 2016, when Clutchey joined the company, Richards mentored and supported him as he expanded his building products background to include the fenestration industry. Clutchey quickly established himself in his role as Branch Manager in Baltimore, and has continued to succeed in every aspect of his position. In 2017, the Baltimore branch was recognized for “Branch of the Year” for excellence in sales and customer service. Clutchey will be based in Baltimore, MD.